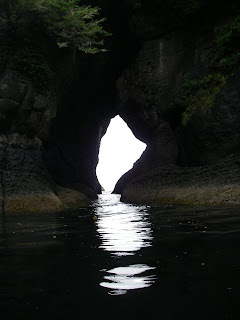 I made a one day trip to Cape Flattery on Saturday. 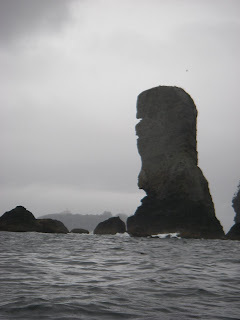 Up early to catch the 6 AM Coho to Port Angles, bought a book at the bookshop anticipating the heavy rains, stopped for breakfast at Clallam Bay and made it to the Hobbart Camp ground on Makah Bay just after noon. Paid my $15 bucks to camp. It's possibly worth it as they have a brand new shower, bathroom facility. I fitted my pitiful stern wheels to the boat and dragged it through the sinking sand about a 1/4 mile to the beach. Punched out through some small breakers and turned right into heavy rain. 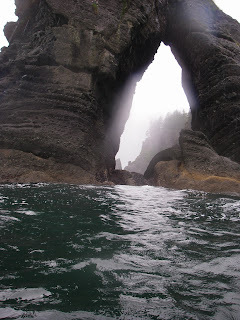 Paddled around to Neah Bay pulled the wheels out and started the 10 k hike back to Hobbart. After three kilometers and the almost total collapse of the wheels I chucked the boat into the ditch and accepted a ride from a commercial fisherman back to the camp ground. I raced back to the kayak, threw it on the roof, struggled out of the Goretex dry suit which was almost completely soaked with sweat and rain. Back at the camp the ground was completely soaked. I passed on stringing the Hammock between the one miserable tree and the car and decided to head home. I made the last ferry with 10 minutes to spare.